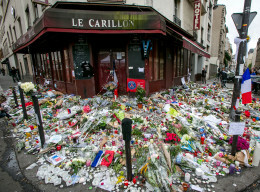 As if the recent jihadist attacks in Paris weren’t tragic enough, they instigated a series of vicious counter-strikes by the French left, who pummeled every available Muslim with good-will, tolerance, flowers, fraternité, and hugs. Following the attacks, a SWPLy crowd in the Place de la République unleashed a barrage of warm hugs upon blindfolded Muslim men. NBC Nightly News anchor Lester Holt praised this snugglefest as a means to “heal the tensions” brought on by the jihadist terror. While I view “hate” as a perfectly natural and justifiable response to terror strikes, I also acknowledge that human psychology is complex. Traumatized people sometimes give flowers or hugs to strangers to comfort not the other, but themselves; sometimes Stockholm syndrome takes effect and hostages start sympathizing with their captors. 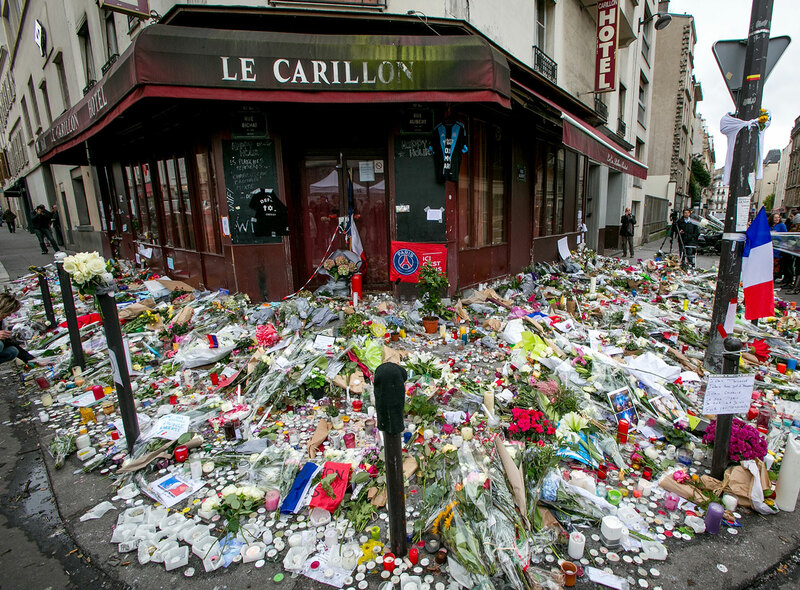 So it is not my intention to mock the philo-Islamic gestures of so many frazzled Parisians. Still, I feel we need an account of them that is less overly celebratory than the one the major news outlets have been providing. The reason I feel this way will soon be clear. My more cynical side tells me that these gestures are nothing more than instances of virtue signaling, of advertising moral rectitude to peers via the camera or social media. But one might also say that such sentiments are “genuine” in the sense that we have been conditioned to behave this way; we have been reared on the logic of Hollywood films and ABC After School Specials where the nice, misunderstood underdog trumps the alpha-jock-bully. The Christian valorization of meekness also likely plays its part here, genealogically. But it is not my intention to give you another Nietzschean critique of these tendencies. I want to focus, rather, on how these friendly gestures, these meek, tolerant hugs work in the context of a counterterrorism strategy. It seems strange that they should figure into such a strategy, but that is precisely what the mainstream media and even officials at the White House have been insisting all week: that our more reasonable, charitable, and meek responses to the massacre do more than just signal our inner virtue, they actively help us to fight ISIS. Conversely, the media and government have been emphatically maintaining, any less-than-tolerant responses to the Paris attacks — from, say, limiting the migrations of Syrian refugees, to subjecting Muslims to stricter security measures, to defacing a mosque — will play right into the terrorists’ diabolical master plan. Max (((Blumenthal))) at Salon makes precisely this claim. Citing an article in Dabiq, the official magazine of ISIS, Blumenthal explains how the terrorists’ strategy of conquest involves provoking, via their attacks, the persecution of Muslims in general, which would in turn drive more of them to align themselves with the caliphate. Vice President Joe Biden, in the most recent White House Weekly Address, describes ISIS’ strategy in identical terms. Biden then refers to the same Dabiq article that Blumenthal cites, which he falsely attributes to the leader of ISIS, Abu Bakr al-Baghdadi (you know, so it sounds more authoritative), and makes the same assertion that growing Islamophobia, the result of ISIS attacks, would only create new recruits for them. But it is totally dishonest for Biden and Blumenthal to say that right-wing opposition to taking in Syrian “refugees” plays into this grand strategy of the terrorists. For the Dabiq article makes no mention of Western immigration policies. Rather, it imagines the persecution of Muslims in the West in (far harsher) terms of a forced conversion to Christianity — which sounds highly unlikely, even absurd, to western ears (see Dabiq, issue 7, p. 66). The writers of Dabiq would find it very inconvenient to tell their readers that there are these people in the West, called “right-wingers,” who want nothing whatsoever to do with Muslims, who want neither to convert them, nor to corrupt them, nor to hug them, nor to encourage them to migrate — people who want nothing more than for them to stay in their caliphate and seek out a life that suits them best. And if that includes stoning for adultery, that’s their prerogative in their own lands. Published: November 23, 2015 | This entry was posted in North American New Right and tagged articles, F. C. Stoughton, hate, ISIS, North American New Right, originals, Paris massacre, terrorism, the liberal mind, the Muslim question, utopianism, virtue signaling, white ethnomasochism, white guilt. Both comments and trackbacks are currently closed. The Left puts a negligible price on Human life, not even the tens of MILLIONs of Victims of Communism are remembered today.. how can we expect The Left to mourn a few hundred? Man you can tell these are the sons and daughters on the 60’s. The low hanging fruit run the west or what’s left of it today…we should focus all our energies on the next generations. These people are entirely worthless. Another well written post. I agree with the idea that each group be it ethnic,religious or otherwise should have their own space on this earth where they can live out their lives according to their own value systems and not be forced to live by the values of others. I finished Houellebecq last night and was somewhat disappointed. As a novel, it’s brilliant with important insights on many issues. It’s also a kind of paean to “moderate” Islam as far as I’m concerned. In this sense, the book is very misleading. The debate on Islam ought to be closed at this point. The problem is all Islam not this fabrication “radical” Islam that gets peddled by various Islamic sympathizers. One of the major strategic objectives of terrorism is to provoke a repressive response from the target government, so as to radicalize the relevant population. Here’s a reality: the multiculturalist West is forced to wage war and intefere in the Middle East precisely because of the presence of so many Middle Easterners/North Africans in Europe. The idea is that we must “destroy radicalism abroad” to prevent it from spreading at home. A more ethical and sustainable solution is simply not to have any of these people living in your nation in the first place, so you don’t have to worry about external influences on their ideology and behavior. But the Left takes the presence of the invaders as a given – and they want more! – so they are locked into this conflict, which will last until the invaders become a majority and then make the external internal. But until then – hugs all around!